Anyone headed to tropical waters for spring break? Feel like searching for sunken treasure? Now you can without getting wet! Want to know how, help me welcome our guest today, Chris Karlsen! Lexi: Authors commonly draw upon personal experiences when writing, so your scuba diving expertise, having a high ranking foreign lover, and penchant for having killers hunt you down came in handy? Chris: I hate to disappoint but I have no high ranking lover in my life, either current or past. Nor do I know of a killer hunting me. Now my scuba experience is laughable. I tried to take lessons in the Bahamas years ago. I couldn’t progress past the practice pool. I failed at clearing my mask among other necessities. The instructors sent me away to sit out the experience in the bar while my husband continued with the class. Just FYI, I handled the bar experience just fine. Lexi:What was your favorite part to write in Byzantine Gold? Chris: I had two favorites: the first was giving Charlotte, my heroine, a terrible decision to make. I loved taking her through the painful process of what she should do. My second: was fleshing out the villain, Tischenko. I loved giving him a personal life and a person who cared about him. Lexi: Did you do any traveling to prepare for this? Scout any exotic locations, check them off the list of possibilities? Chris: I do travel a lot. I’ve been to Turkey many times. I love the country. I have also visited the Greek Islands and I think the Aegean and Eastern Mediterranean is so beautiful. I knew after the first visit to Turkey that I set a book there, which I did with Golden Chariot. 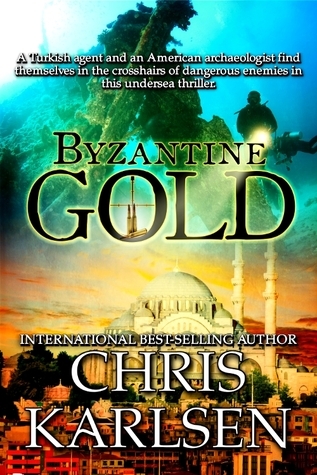 It seemed natural to me to set the sequel, Byzantine Gold, in the Eastern Med, like Cyprus. I don’t know that I “scout” locations per se. I love to travel and a place will just strike me. It’s an internal connection that is almost immediate. If I do a third in this series, I’d set it in Turkey again. I had the opportunity to visit Malta twice over the last couple of years. I really like Malta. Somewhere down the road, I want to use it for a setting. Lexi: Do you have plans to continue the Dangerous Waters series? Any more high action, treasure hunting books headed our way? Chris: I would like to do another in the Dangerous Waters series. I gave Iskender, a friend and agent co-worker of my hero, Atakan, a good amount of page time in Byzantine Gold. I wanted to give myself the possibility of using him in a third book where he’d be the hero. I have also given page time to Charlotte’s brother Nick, a Chicago cop, in this book and the first, Golden Chariot. Several readers have mentioned wanting to see him as the hero of a story. I’m thinking I’d like to do a third book using both Iskender and Nick as heroes working together. Lexi: Sounds great! Love the name Iskender. Thanks for taking the time to answer some questions Chris. Good luck with Byzantine Gold! Chris: Thank you, Lexi for speaking with me. I would love to hear from your followers any thoughts they have on the books. Chris has an awesome giveaway for one of our dear readers today (international...isn't she generous?!). To the winner: an ebook of Golden Chariot, a tote with her covers on it, Turkish charm keychain, and a small box of soap petals shaped like roses! To enter leave a comment for Chris, book wise or any of you have interesting scuba experiences? Then fill out the Rafflecopter below, good luck! I want to thank Crystal for inviting me today. I want to let everyone know that Byzantine Gold is only available on Amazon until the end of March. All my other books are available in most places. Thank you. I'm glad you enjoyed the interview. If you'd like to see my book boards for all my novels, they're on my Pinterest page: http://pinterest.com/chriskarlsen. I enjoyed making them as I get to use my "dream" cast. The lack of scuba experience wasn't for lack of trying. I really wanted to learn and do well. I just don't have a knack for it. For my books, I'm very lucky to have a dear friend who is an archaelogical diver (retired now). He answered my many, many questions and was a wealth of info. He lives on the Aegean and even when the dive season is over, he still goes out all the time. The book sounds great. love finding a new books o read. I have never been able to scuba Dive. But I would love to search fro treasure. That would be amazing. Thanks for sharing your wonderful books. I really loved Golden Chariot; thought it was a really great story. I'm saving my pennies for Byzantine Gold. Have never had the opportunity scuba dive. I am glad I could tempt you. If you'd like to see a trailer for both Golden Chariot and Byzantine Gold, on my website: www.chriskarlsen.com. On the Home Page you can see the trailers for not just those but my two paranormal romances from a different series. Thank you for joining me again. I'd love to be part of a recovery team, if only as an observer. Just to hold an artifact from a ship sunk centuries or milleniums ago would be incredible. I love that you loved Golden Chariot. In Byzantine Gold you get to see how the relationship between Atakan and Charlotte has grown. You needn't save your pennies for Byzantine Gold. If you have a Kindle, tomorros is a free download day. There'll be three more next month too. I'll announce those on my FB page. Your book covers are gorgeous! Thank you. I had a lot of input on them. Byzantine Gold was my first experience with a new designer. I thought she did a fab job. I worked closely with her so she knew my aesthetic and the feel I wanted. Down the road, I plan to "redo" my covers for Heroes Live Forever and Journey in Time. I'll keep Jimmy Thomas the male model but go for a slightly different look. Thank you for visiting with me again. Snorkeling is about as much as I can handle too:) I do love to watch good divers on NatGeo and Discovery when they're swimming around coral beds or playing with dolphins etc. The undersea world is so beautiful. No scuba diving for me. It's not something I'm interested in although I have friends who enjoy it. I have snorkeled and enjoy the ocean. I love to watch the dolphins and whales. Great interview! Thanks for sharing. You are a new author for me and your books sound/look awesome. I love dolphins and whales too. Glad you liked the interview. If you have a Kindle, Byzantine Gold if a free download tomorrow. Golden Chariot, which is book one in this series is available for Nook, Kindle, Kobo etc but no longer on free download days. I'm glad the stories sound interesting to you. As I mentioned earlier, you can see my "dream" cast for all my books on my pinterest page.